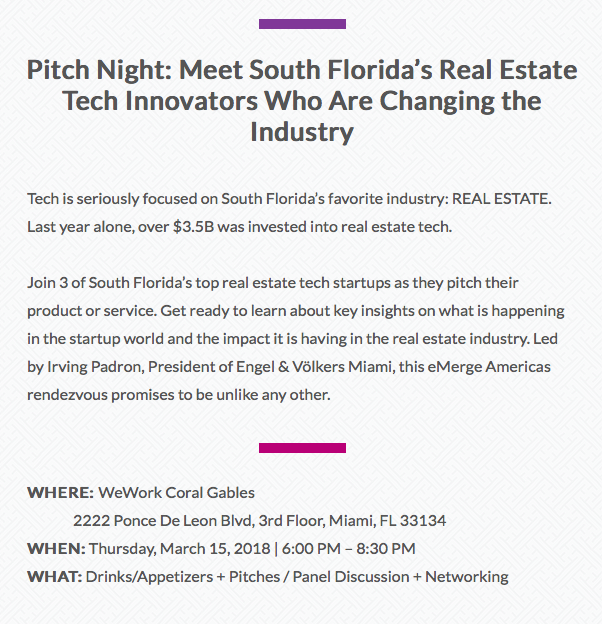 eMerge Americas & Engel & Völkers invite you to join them at the Real Estate Tech Pitch Night Rendezvous. This is the chance to meet South Florida’s Real Estate Tech Innovators Who Are Changing the Industry. Last year alone, over $3.5B was invested into real estate tech. Join 3 of South Florida’s top real estate tech startups as they pitch their product or service. Although it is currently listed as SOLD OUT — You are still invited! There is plenty of room so please show up and join in.